It's finally here! 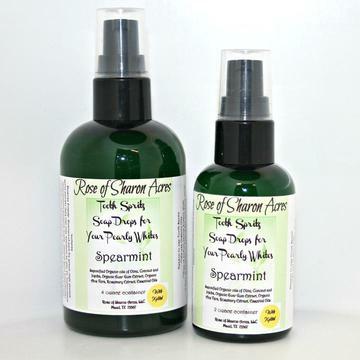 Tooth Chips Spritz - Soap for Your Pearly Whites is a liquid soap that is easier to apply to your toothbrush. Xylitol helps fight off bacteria that creates cavities. Read more. Saponified Organic Oils of Olive, Coconut and Jojoba, Organic Guar Gum Extract, Xylitol (if selected), Organic Aloe Vera, Rosemary Extract, Essential Oils. I used tooth soap from another store and it was fine and then I found your site and bought your tooth soap, (clove) and LOVED the way it worked. Recently we tried the tooth spritz and I have to say, it is even more fantastic than the chips. I still use both, and like the other comments, I love that you have NO morning breath. I gave one to my daughter, and no joke, she keeps telling me that she is totally hooked on brushing her teeth now. Each time I have a dental appt., my hygienist asks if I had my teeth cleaned before coming to her. HA HA HA! Now who would do that? You have saved me hundreds in cleanings and dental work. P.S. I am 62 and my enamel is getting better and better. Thank You! I have been using this for a number of years and I wouldn't go back to commercial toothpaste. Absolutely marvelous product! Great alternative to traditional meds that harm your vital organs.